Schwaller de Lubicz moved to Egypt in 1935 with his wife Isha and her daughter Lucy Lamy. 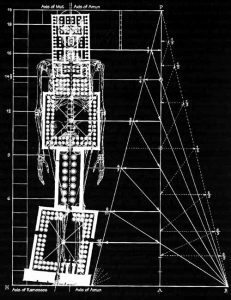 Together, they measured and mapped the Temple at Luxor, including floors, ceilings, walls, columns, and everything else that might yield information as regards Sacred Geometry and proportion. 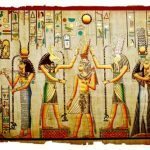 For the next fifteen years they would study the ancient Temples of Egypt, mostly The Luxor Temple, and document their findings for the world to study. The French speaking family would produce their first works in Paris, then little by little their works were translated into English and other world languages. The famed Temple of Man would not be released in English until the winter of 1998, nearly fifty years after it was completed in French. 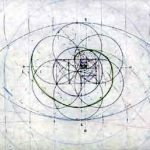 The story here pales in comparison the the study presented by Schwaller and his family, but hopefully we can share enough information to introduce you to the ingenious work of this brilliant individual, his wife and her daughter. To his friends and students he was affectionately know as “Aor” and so we will call him Aor. a.) 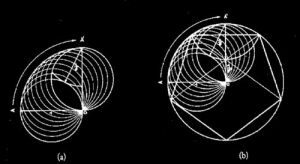 Following construction of a quarter arc, any diameter of a circle, equal to 1, when rotated around one of its ends will have its opposite end at a distance of 1/? 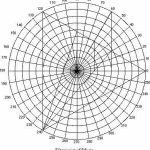 from its original circumference. From this function, which is the result of a cycle, innumerable forms emerge. The wedjat eye and the subdivision of the hekat. The hekat, considered as a unit of capacity for the measure of grains (thus of a lunar capacity), is subdivided into sixty-four parts. 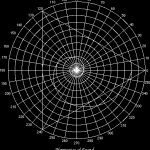 The Symbols used to express these subdivisions are derived from the ancient myth according to which the eye of Horus was fragmented by Seth. Later Thoth (Hermes, Mercury), symbolized by the ibis, miraculously “filled” or “completed” the eye, bringing together its parts so that the eye reacquired its title “the whole eye” or “the healthy eye”. Of the two eyes, it is then the lunar one that is identified with the measure of volume. The hekat is subdivided into 1/2, 1/4, 1/8, 1/16, 1/32, and 1/64. The fractions added together make 63/64 with 1/64 missing. 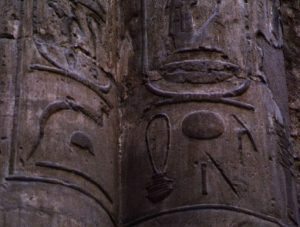 At right is a hieroglyph from the Luxor Temple showing part of the hekat. The idea of following the sun in its precession is an understatement compared to the amount of information contained in the proportions of this great Temple, but let’s not loose sight of this fact. 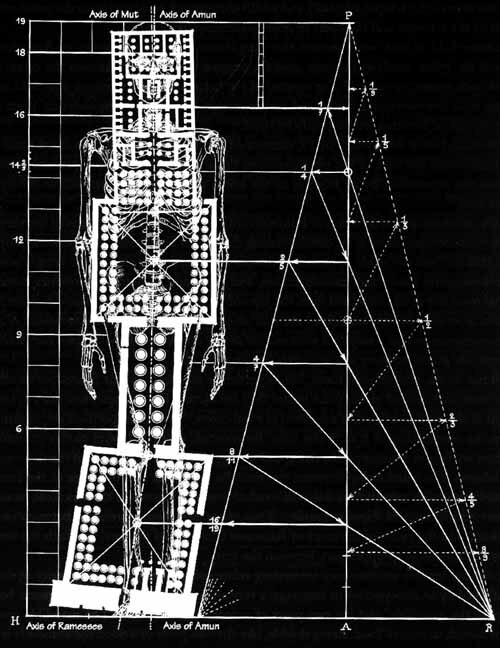 Aor teaches us that the human cannon is 19 “palms” in height, up to the point of the pineal gland. [See enlarged diagram ] The palm is the width across the hand. There must have been a great reason for Schwaller de Lubicz to leave the cushy trimmings of a Geneva research facility, provided to he and his followers. In 1935 he went to Luxor and immediately learned something, although we have little but conjecture about what that something might have been. He went back to Geneva and packed his bags and returned to Luxor to spend the better part of the next fifteen years. While at Luxor he wrote many books on the subject of the proportions of the Temple, and their relationship to alchemical processes. 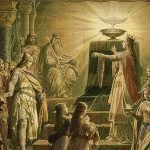 Unfortunately it would be another fifty years before his most important work, The Temple of Man would be translated into English. The Spiritual representations of the hieroglyphs at Luxor abound. 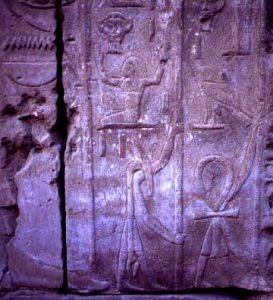 Here we see the personification of the Ankh, right bottom, with arms holding a staff. To the left we see the Uas scepter, personified as human and holding another staff. Above the Uas we see the personification of Ka with raised hands depicting Spirit. 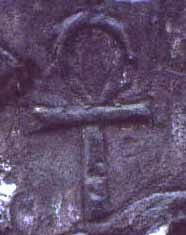 The Ankh seems to have been added as an afterthought, perhaps by the Coptics who inhabited the Temple in the Ptolemaic era. 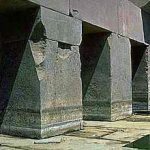 Most of the fluted columns are filled with hieroglyphs and cartouches of the men who built the Temple. To the right of center, there is a hieroglyph of Hese, the ancient scribe noted by the ink well. We all love visiting the Luxor in Las Vegas, but you can play the same games from home for free! Learn where to play at CasinoSitesUSA.com.